I see... Yet another "unbuilt motorway"? OK, the M650 was initially proposed in 1968 to bypass the Aire Valley towns of Keighley and Bingley, and would have ended near Shipley. However, the Ministry decided to keep things under its collective hats for a while, and the proposal was only published in December 1973. It lasted almost exactly twelve months. Simple really - it was something easy to kill off during the Oil Crisis of the 1970s, and so it was slowly watered down, with a revised proposal in 1975 to a simple dual carriageway bypass. However, the Public Inquiry for this route ended up being abandoned due to disruption, and a mildly revised proposal then raised its head in 1978. It too was killed off by 1980 and so continued the on, off, on again nature of improvement to the roads in the Aire Valley which finally ended up in the A650 Bingley Relief Road, opened in 2003. 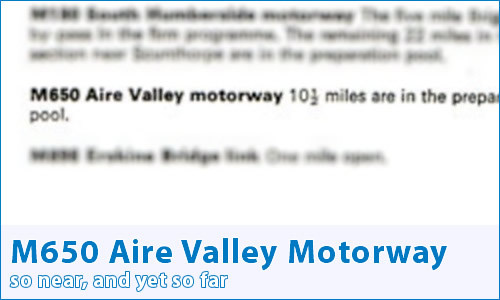 Well, you're quite close to the northern side of Bradford - and the story of the Bradford North Radial Motorway is told on the M606 page. If you go a little to the west, over the Lancashire border you come to the town of Colne, eastern end of the M65. Ah, I get it! Another motorway link across the Pennines! Bingo! You're good, aren't you? I have my moments. Anyway, how's about getting a proper look at that map showing the route then? Having driven a lot down the A650 from Skipton to Bradford, this has to be one of the most needy bits of improvement in the UK. Leeds/Bradford is a huge conurbation but the roads to the north are dire. Bingley bypass does go some way (and it is a pretty impressive road) but a continuation of the M65 is really what was needed. The M650 was the first motorway (as far as I know) to be heckled to non-existence! Yet improved cross-pennine links would have dramatically improved the economy of Bradford. Adding to Stuart Mitchell's comments it would have done wonders for the Lancashire valleys of Burnley, Colne and Nelson, not to mention Gateway to the Dales Skipton. I used to do this route every weekend for 3 years, the section through Bingley was dire, Bradford was no problem!